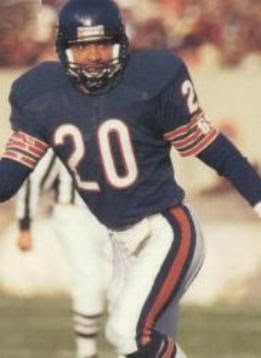 Recipient of the 1989 Jim Thorpe Award as the nation’s top collegiate defensive back, Carrier was chosen by the Bears in the first round (sixth overall) of the 1990 NFL draft. The pass defense had ranked 24th in the NFL in ’89, and Carrier moved directly into the starting lineup at free safety. What he lacked in size and speed, he made up for with outstanding instincts and was a solid hitter. Bears went 11-5 to finish first in the NFC Central while leading the NFL in interceptions (31). Won NFC Wild Card playoff over New Orleans Saints (16-6). Lost NFC Divisional playoff to New York Giants (31-3). Carrier was hampered by a broken wrist and his interception total dropped to two in 1991, but he was still chosen to the Pro Bowl, along with SS Shaun Gayle. A disappointing season in ’92, which was also a down year for the team, was followed by much improved play in 1993 and a return to the Pro Bowl. He remained in the starting lineup for another three seasons with the Bears before being released in 1997 and picked up by Detroit. Carrier intercepted five passes, his most since his rookie year, as he overcame a back injury early in the year. After three solid seasons with the Lions, he moved on to Washington as a free agent in 2000 where he played one last year. Overall, Carrier intercepted 32 passes, one of which he returned for a TD. He received at least some All-NFL honors after two seasons and was selected to the Pro Bowl three times.